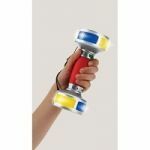 Shaped like a simple free weight, with flashing lights and catchy music, it's designed to get kids working out in a fun way to commands, from jumping jacks and arm curls to “Let's Surf” and "Dance Party." Features 65 exercise commands, 22 tunes, and 22 light shows. Requires 3 "AAA" batteries, included. Ages 4 and up.